A dictionary definition of Bioethics is, 'the ethics, or moralprinciples and rules of conduct, of medical and biologicalresearch'. This book is an introductory text of just biological andnot medical bioethics. 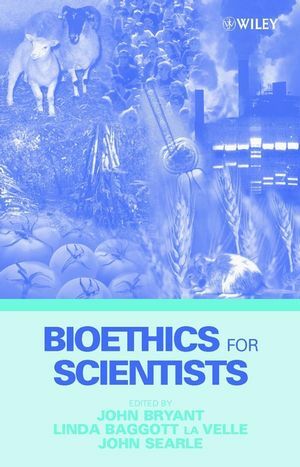 It covers the ethics of experimentation,including genetic manipulation, in plants and animals; ethics andbiodiversity, ethics and the environment. There is increasing interest in bioethics - both in academia andby the media and the general public. Awareness of bioethics isincorporated into Biological / Environmental Science courses, plusthe first dedicated modular courses on bioethics are starting up. * Chapters include environmental, animal, agricultural andreproductive ethics as well as a wide range of issues regardinggenetic manipulation. John A. Bryant is Professor Emeritus of Biosciences in the College of Life and Environmental Sciences at the University of Exeter in Exeter, UK. Linda Baggot la Velle is Professor of Biology in Education, Institute of Education at the University of Plymouth in Plymouth, UK, and Visiting Professor of Education at Bath Spa University in the UK. John F. Searle is the editor of Bioethics for Scientists, published by Wiley. Section 1: Setting the Scene. Introduction to Ethics and Bioethics(Michael Reiss). The Public Evaluation of Science and Technology (BarryBarnes). Section 2: Ethics and the Natural World. Introduction to Environmental Ethics(Christopher Southgate). The Use of the Rainforest as a Test Case in Environmental Ethics(Christopher Southgate). Environmental Ethics: Further Case Studies (Christopher Southgateand Alex Aylward). Human Use of Non-Human Animals: A Biologist's View (David dePomerai). Human Use of Non-Human Animals: A Philosopher's Perspective (R. G.Frey). Section 3: Ethical Issues in Agriculture and Food Production. GM Crops and Food: A Scientific Perspective (Steve Hughes and JohnBryant). The Patenting of Genes for Agricultural Biotechnology (SteveHughes). Crop Biotechnology and Developing Countries(Geeta Bharathan, ShantiChandrashekaran and Tony May). Section 4. Ethical Issues in Biomedical Science. Starting Human Life: The New Reproductive Technologies (LindaBaggott la Velle). Genetic Information: Use and Abuse (Bartha Maria Knoppers). Human Genetics and Genetic Enhancement (Peter Turnpenny and JohnBryant). Patenting Human Genes: Ethical and Policy Issues (AudreyChapman). Cloning of Animals and Humans (Harry Griffin). Dealing with Death: Euthanasia and Related Issues (JohnSearle). Animal Experimentation in Biomedical Research (Linda Baggott laVelle).